It will be brighter than any other time of the year and will be visible all night long. 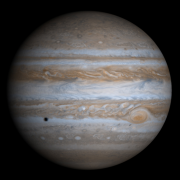 This is the best time to view and photograph Jupiter and its moons. A medium-sized telescope should be able to show you some of the details in Jupiter’s cloud bands. A good pair of binoculars should allow you to see Jupiter’s four largest moons, appearing as bright dots on either side of the planet. From Baton Rouge it will be visible between 20:19 and 05:45. It will become accessible at around 20:19, when it rises 7° above your south-eastern horizon, and then reach its highest point in the sky at 01:04, 43° above your southern horizon. It will become inaccessible at around 05:45 when it sinks to 8° above your south-western horizon.